Leadership Mastery Course by Dale Carnegie – Discount! Are you adequately rewarded for your efforts? If you answered “no” the skill of leadership can help you! The Dale Carnegie Leadership Mastery Course can put you in total control of your life and make your dreams a reality. It can move your career on to the fast track and bring you high levels of prestige. Many companies require that all job applicants listen to this course before they can be hired. This is a must-have program for anyone who wants to get ahead in business–and in life. 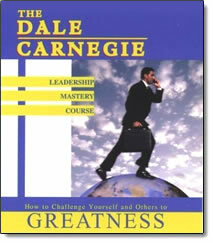 Challenge yourself and others to greatness with the Dale Carnegie Leadership Mastery Course.